"It would be hard to name a better commonplace book for summer lawns. . . . The lover of poetry, the lover of gardening, and the lover of quaint, out-of-the-way knowledge will each find something to please him. . . . It is a delightful example of gardening literature. "—Pall Mall Gazette. "Mr. Ellacombe, with a double enthusiasm for Shakespeare and for his garden, has produced a very readable and graceful volume on the Plant-Lore of Shakespeare. "—Saturday Review. "Mr. Ellacombe brings to his task an enthusiastic love of horticulture, wedded to no inconsiderable practical and theoretical knowledge of it; a mind cultivated by considerable acquaintance with the Greek and Latin classics, and trained for this special subject by a course of extensive reading among the contemporaries of his author: and a capacity for patient and unwearied research, which he has shown by the stores of learning he has drawn from a class of books rarely dipped into by the student—Saxon and Early English herbals and books of leechcraft; the result is a work which is entitled from its worth to a place in every Shakesperian library."—Spectator. "The work has fallen into the hands of one who knows not only the plants themselves, but also their literary history; and it may be said that Shakespeare's flowers now for the first time find an historian."—Field. "A delightful book has been compiled, and it is as accurate as it is delightful. "—Gardener's Chronicle. "Mr. Ellacombe's book well deserves a place on the shelves of both the student of Shakespeare and the lover of plant lore. "—Journal of Botany. "By patient industry, systematically bestowed, Mr. Ellacombe has produced a book of considerable interest; . . . full of facts, grouped on principles of common sense about quotations from our great poet."—Guardian. "Mr. Ellacombe is an old and faithful labourer in this field of criticism. 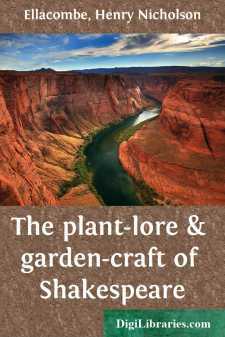 His 'Plant-lore and Garden-craft of Shakespeare' . . . is the fullest and best book on the subject. "—The Literary World (American). OF ORIEL COLLEGE, OXFORD,VICAR OF BITTON, GLOUCESTERSHIRE, AND HON. CANON OF BRISTOL. PRINTED FORW. SATCHELL AND CO.,AND SOLD BY,SIMPKIN, MARSHALL, AND CO.,LONDON. "My Herbale booke in Folio I unfold.I pipe of plants, I sing of somer flowers." Cutwode, Caltha Poetarum, st. 1. "Faultes escaped in the Printing, correcte with your pennes; omitted by my neglygence, overslippe with patience; committed by ignorance, remit with favour." Lily, Euphues and his England, Address to the gentlemen Readers. Since the publication of the First Edition I have received many kind criticisms both from the public critics and from private friends. For these criticisms I am very thankful, and they have enabled me to correct some errors and to make some additions, which I hope will make the book more acceptable and useful.